The district of Jiading is approximately 20 kilometres from downtown Shanghai, to which it is linked by Shanghai’s first expressway, the Hujia Expressway. It has numerous historic and scenic sites, a welcome change from the new developments all over the rest of the city. Factoid: Jianding is where the popular Shanghai-style xialongbao, or dumpling, was born! Jiading is commonly known as “Auto City”, particularly Anting Town. Auto City gets its name from its economic mainstay: making automobiles and auto accessories. The ancient town of Anting, while still quaint, is now one of Asia’s largest automotive trading centres, with research and development, and service and logistics and exhibition centres. Nanxiang Town is a particularly celebrated area, because it is home to the lush garden of Gu Yi, and the large temple of Yun Xiang Si, which both attract swarms of tourists. 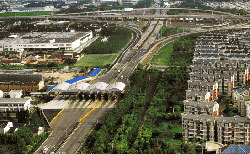 It has relatively new residential villas, and is the site of Formula One’s Shanghai International Circuit.